Accepting credit cards through your online store will be a necessity! In order to do so, you will need a merchant account and payment gateway. Our eCommerce software can be integrated with many of the top payment gateways in the industry. Merchant accounts are accounts that accept and hold credit card transaction monies. These accounts can be established through Merchant Service Providers (MSP) such as banks or via Independent Service Organizations (ISO). We have worked with several of the popular merchant account providers. E-Online Data is a great provider for basic shopping carts and the Chase Paymentech Orbital Gateway is great for the more sophisticated cart system. 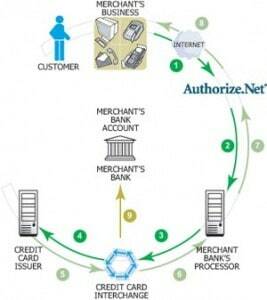 A payment gateway is a service which authorizes payments through your online store into your merchant account. The gateway links your shopping cart’s checkout page to your merchant account. 1. A customer enters his or her credit card details into a secure online form, a standard checkout page in our e-commerce software. 2. The credit card information is sent to your payment gateway which will usually perform anti-fraud checks, including validating the credit card information and billing address provided. These checks protect you from fraudulent purchases. 3. The credit card details are then forwarded through a payment processor to the credit card association (Visa, MasterCard, etc.). 4. The transaction is either authorized or declined, depending on the state of the customer’s credit limit. If it is authorized, funds are reserved to cover the transaction. 5. The results are communicated to the merchant. After the goods ship, the merchant can issue a Capture Request which is a request for Settlement, the final stage in which the funds’ transfer to the merchant takes place. Two popular payment gateways which we work with often include Authorize.Net and Plug N Pay.